Unlimited online backup – There are times when we need to stop worrying about how many quota do we have left? Should I backup my music files? Should I remove certain files to make way for my new documents? Thanks to Carbonite Online Backup solution, these thoughts can be thrown away to the bin. With just $59 a year (less than $5 a month), you can backup all of your documents, photos, music, and other regular files on their online server. Music and photos occupy a lot of space, especially if you have to back them up on a different drive. If you are a professional photographer, you’ll most likely want to store the RAW files (and they can be huge at times). If you have to shoot tons of photos constantly, then backing all the photos up will definitely become a problem sooner or later. With Carbonite’s unlimited storage service, you can back these files up without worrying. You can simply install the Carbonite application either on your Mac or Windows PC and let it do the rest. Backing up will be done automatically whenever changes are detected so you don’t have to worry about scheduling backups and all that. You can even access your backup files from your smartphones and tablet devices like the iPad. This way, you always have access to your backup files anywhere you go. 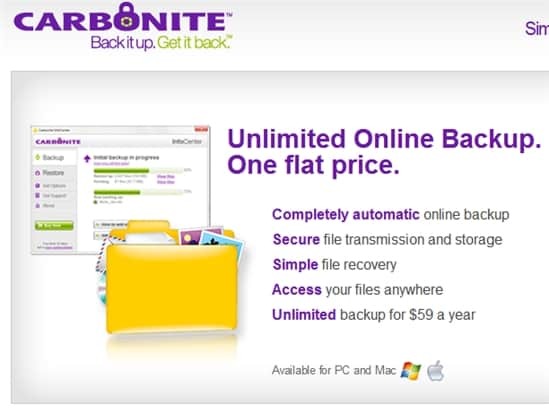 So check Carbonite out if you are looking for an unlimited online backup solution and apply the coupon code BLOGAD to get the first 2 months for free. With Carbonite, computer backup is cheap, unlimited, secure, and automated.